Overall residential property sales to foreign buyers were down 1.3 percent, or by about $10 billion, for a total of $102.6 billion. Chinese buyers continue to invest the most heavily in U.S. real estate, more than buyers from the next four countries combined. Although Americans are notoriously insular, the economic upheaval overseas is going to influence the U.S. housing market in one way or another. Between China’s economy and the British exit from the European Union (aka Brexit), there’s a lot happening that will have an effect here. 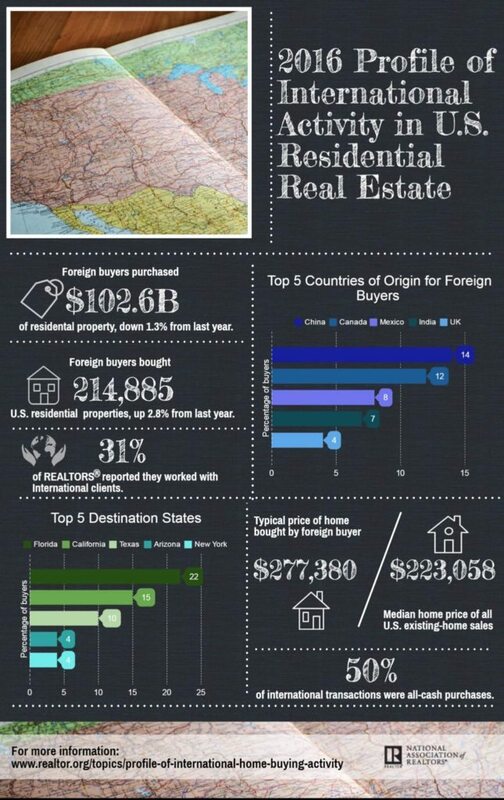 The National Association of Realtors released its annual 2016 Profile Of International Activity In U.S. Residential Real Estate — which covers U.S. residential real estate sales to international clients between April 2015 and March 2016 — and there were a few surprises. In addition, non-resident foreign buyers bought the lowest dollar volume since 2013. NAR is attributing this to home price increases and weaker foreign currencies against the dollar. However, Chinese buyers continue to invest the most heavily in U.S. real estate. This trend keeps heating up — with the total dollar sales figure from buyers in China exceeding that of the next four countries combined. “Weaker economic growth throughout the world, devalued foreign currencies and financial market turbulence combined to present significant challenges for foreign buyers over the past year,” said NAR’s Chief Economist Lawrence Yun. “While these obstacles led to a cool down in sales from non-resident foreign buyers, the purchases by recent immigrant foreigners rose, resulting in the overall sales dollar volume still being the second highest since 2009. Chinese buyers continue to invest the most heavily in U.S. real estate. Furthermore, today the value of the British pound hit a 30-year low point, exceeding those losses recorded immediately after Britain voted to leave the European Union. The graph above visualizes the pound’s wavering value since Brexit. Hot spots: Which states do foreign buyers prefer? Moreover, fewer international buyers are using Realtors, but more Realtors are seeing interest in international property. In fact, 14 percent of Realtor respondents indicated that they had a client looking to buy internationally, up from 6 percent from last year. And what about the value of these homes sold in the U.S. to foreign buyers? The median price stood at $245,331 in this year’s survey — the first time that NAR collected this data from U.S. sellers.